Whether your prized bicycle is a road or town bike, a racer or a mountain bike, you’ll be keen to keep it safe and secure. So what measures do you have in place to reduce the risk of your bicycle becoming a victim of theft? Many people opt to keep their bicycles in a garage or shed, but the problem is that thieves know this only too well. If you are a bicycle owner, read on for the expert security advice you need to keep it protected courtesy of our seven practical tips. Does your home insurance actually cover you to replace your bicycle should it be stolen? Some insurance providers require you to list bicycles as a separate item. Others have single article limits that do not cover the value of some of the higher end models, making it necessary to insure the bicycle separately. You will also need to check what the insurance policy stipulates about how your bicycle should be stored. Some policies do not cover bicycles kept in sheds. Others set out specific security measures that must be in place, such as particular grades of chains and padlocks, and sometimes intruder alarms. Never leave your bike on show, even for short periods of time. This includes leaving your garage doors open with the bike inside. You never know who might be passing by with the intention of taking note of what could be available for the taking. If you store your bicycle in your garage, you’ll need to ramp up your garage security. The starting point is your garage doors. Up and over doors are prone to breach, so it is always wise to add ground and side locking points. Pad-bolts, high security padlocks and coach bolt clasps are all ideal for this purpose. If you have electric or roller garage doors, your supplier will be able to advise you on security measures that are specifically suited to the make and model. Take care when taking steps to secure these types of garage doors, because you may inadvertently invalidate your warranty. Never overlook the security of other entry points to your garage. Be certain to secure any windows or rear doors with lockable bolts. Window grilles may also be wise if the windows are particularly vulnerable. For added security, bolt anchors to the walls or floors and lock your bicycle down with a chain, cable or D-lock. If the shed is where you store your bicycle, and you have checked with your insurance provider that this is acceptable, then be sure to take steps to make your shed as secure as possible. Use an insurance approved padlock and a robust coach bolt clasp to secure the door then look at securing the bike itself. Bolting ground anchors under the shed to which you can attach chains for locking your bike down is advisable. Alternatively fix something robust inside the shed to chain your bike to, but make sure whatever it is attached to is robust enough to withstand force. If you don’t have anywhere suitable to store your bike, consider investing in an approved lockable steel bike locker. Be sure to fit an approved padlock of the appropriate grade. 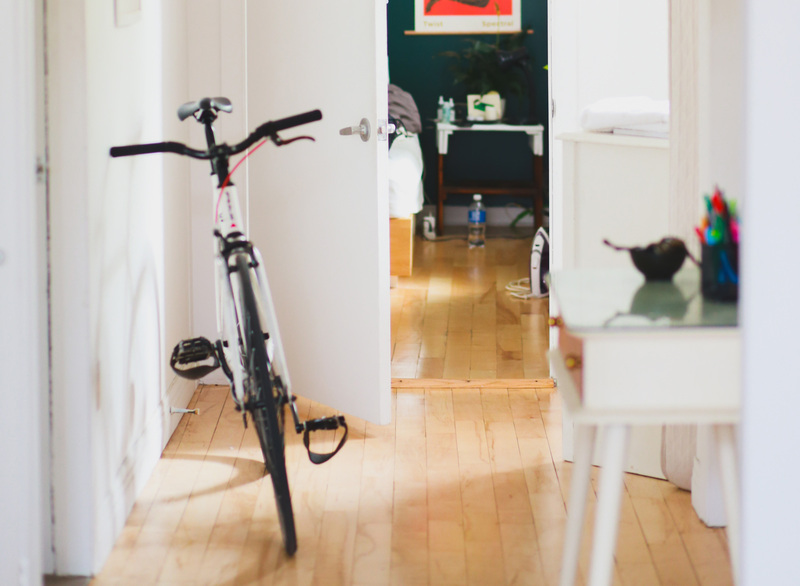 Wherever you have your bicycle stored, installing an alarm and security lighting will keep it well protected. Both alarms and lighting act as deterrents to thieves, and of course provide an added layer of security. Sold Secure is a company owned by the Master Locksmiths Association. It aims to certify security products using manual attack testing so that the risk of crime can be reduced. Sold Secure locks are tested and rated to bronze, silver or gold standard, with bronze being the lowest. Sold Secure Gold bicycle locks offer top end security for high risk situations. They provide at least five minutes of security against high level tools. Sold Secure Silver bicycle locks provide three to four minutes of security against high level tools in greater risk situations, and Sold Secure Bronze locks offer one to two minutes against minor tools in regular risk situations. Always be on the lookout for reports of bicycle thefts in the areas you visit or where you live. Check local sources such as social media groups and media reports. If there is a spate of thefts then you would be wise to further ramp up your bicycle security. Always check with your insurance provider that the lock you are using features on their approved list. Our blog on Sold Secure explains the rating system in more detail. At Barry Bros Security we have been helping the people of London secure their precious belongings for more than 60 years. As an accredited Master Locksmith Association security specialist we are able to offer a sophisticated level of expertise that is tailored specifically to your needs and level of risk. Talk to us today if you are looking for effective ways to safeguard your prized bicycle, or visit our London showroom for helpful advice. We look forward to being of assistance.